There were some controversial guests at the White House Correspondents Dinner, the annual event where journalists and cultural dignitaries join Washington, DC elite for an evening of laughs and networking, on Saturday night (Kim Kardashian, Lindsay Lohan, the cast of Glee). And of course both President Barack Obama and host Jimmy Kimmel turned cringe-worthy headlines into punch lines (“What’s the difference between a pitbull and a hockey mom? The pitbull is delicious,” Obama announced, in one of about a dozen jokes about his and Mitt Romney’s relationships to man’s best friend). Kimmel even referenced Kardashian’s new boyfriend, joking that Obama was mistaken when he called Kanye West a “jackass”: “No offense sir, but I think you got the wrong West. I think you meant Allen.” Florida Republican Allen West, that is. If that joke was a little obscure for the hip-hop fans watching, President Obama, who has shared the contents of his iPod and Spotify playlists with us before, went a little more direct. “In my first term I sang Al Green,” he said, referencing the 10 Seconds That Saved the Music Biz. 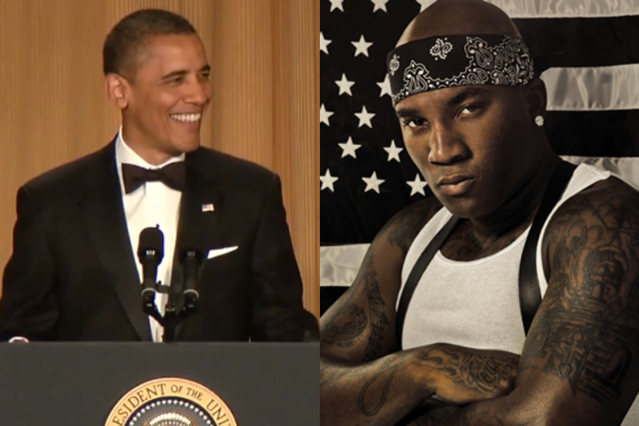 “In my second term, I’m going with Young Jeezy.” Michelle Obama reacted with an enthusiastic, “Yeah!” and Obama continued, “I sing that to her sometimes.” He’s presumably referring to Jeezy’s 2008 track “My President” featuring Nas, and not one of the billion cocaine raps the artist known as the Snowman has churned out over the years. When word of the shout-out reached the rapper, he tweeted from Europe, “You know they love the snowman in the White House #Turntup,” thereby capping one giant coke joke. Obama, however, was not done there. He also jested, “In my first term, we repealed the policy known as ‘Don’t Ask, Don’t Tell.’ In my second term, we will replace it with a policy known as ‘It’s Raining Men.’ ” Hallelujah!